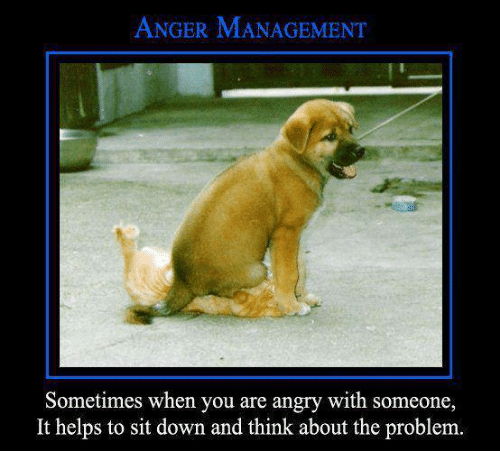 Just a little humor this Monday morning – please do NOT handle the people you’re angry at by sitting on them! Over the past few weeks, I’ve been gradually recovering from a small bit of surgery – I’ve lost 15 pounds (I need to lose a good bit more, but that’s a start). I’ve been wearing lounge pants, sweats and track pants, because they’re roomy and the waist is elastic – much more comfortable than a zipper. Well, today’s the day- I got my jeans out of the closet, where they’ve been hanging for the past five weeks or so, and slipped them on. It doesn’t matter that I’m wearing the larger size (I’d just bought some a size smaller); right now I’m just happy to be in something different. Now to keep using good eating habits to take some more weight off. One thing I’m trying to change is how I look at sweets- it’s helped that I don’t really have such a sweet tooth anymore. I’ve found a great dried fruit mix that hits the spot and seems to be better for me than candy – at least I feel a bit smarter eating it. By the way, according to my blogger dashboard, this is my 100th post… woot! Last week I had minor outpatient surgery, and when I got home, I still had traces of the anesthesia in my system, plus they’d given me some pain meds. Trust me, I was feeling GREAT! So I had to ride to Greenville to meet a friend/client for lunch, and to pick up some copies of her newest book, fresh from the printer. We’ll be shipping complimentary copies out to newspaper religion editors and some other folks who might give us a good review and some publicity. I love riding my bike, and I especially love riding by myself – very freeing to not have to worry about anybody else but myself, going at my own speed, whether it’s 45 or 75, seeing what I want to, stopping when I want, and just being on my own. It’s also a lot of fun when it registers with passengers/drivers in other vehicles when they realize that’s a FEMALE riding that bike… most of them are not surprised, but every once in a while, you get some VERY funny faces. I don’t care if it is almost 2009, it still seems to be a novelty for a girl to be riding her own bike. Anyway, we had lunch and a great visit; then back outside to pack everything in my bags (and pockets) and head back. To come back home, I have to take a bridge over the interstate; for some reason I got in the wrong turn lane, and only after there was no way out of that lane, did I realize I was headed onto the interstate, instead of back towards Highway 10, which is what I wanted. I had two choices – either go into high panic mode and just sit in the middle of road, blocking traffic, or hitting the interstate and getting off at the next exit, about 15 miles away. Panic is not my usual way of handling things (well, maybe sometimes after everything is over), so I just tooled on down the ramp and onto the interstate, headed for Ft. Deposit. Not really a big deal, except that was my first time on the interstate by myself, the traffic was very heavy, and there was quite a wind blowing. I did okay, except for one incident, when some traffic was merging onto the road, and I moved over into the left lane to give them room- some nimrod decided she needed to be my back bumper decoration and hung right behind me until I could get a clear space to move back into the right lane. Not much a 600 pound bike and rider can do to a large sedan, other than scratch it up a bit in passing, and I don’t do that kind of thing. If I could have told her a few things, I might have, but she was laughing and cutting up with her kids as she passed me- I still am not convinced she saw me, even though I was directly in front of her – I could have spit backwards and it would have hit her windshield. I did get lots of smiles and waves from other vehicles, especially the three guys trailering their bikes somewhere – and it was a nice ride, anyway, despite some people showing their ignorance. When I did get off at Ft. Deposit, a very nice clerk at a gas station gave me directions back towards home that did not include getting back on the interstate – I figure there’s no need pushing things. So now I’m home, got to see some new areas, got a very nice ride in, and still home in time to walk the dogs, get supper started and more importantly… GET BACK TO WORK! The current assignment on the DPS forums is themed “Relax”; this is my entry. My original idea was to have DH and L’il Red on hubby’s bike, riding slightly behind me on mine. Red would take a picture using her P&S, catching her dad’s shoulder and side of his head, framing me on my bike. Well, you know what they say about ‘best laid plans’… DH’s bike is still in pieces in the carport, and the parts aren’t in yet. So… I just rolled my bike in front of my green backdrop and took some pictures. Then I stepped out into the road in front of my house and snapped some more pictures. If you were one of the folks driving by while I was waiting to get in the road, no I haven’t lost my mind, just having some fun. Then I stepped back inside after breaking down the set (that backdrop support sure was very cost-effective, but it’s not the quickest to take apart). Photoshop is wonderful, and it wasn’t too long before I had the shot I wanted (shown above). I’ve gotten several comments on it so far, and while it’s not perfect, I’m pleased overall with how it turned out. Now, if we can just get DH’s bike back on the road- besides the problems he’s already having, we got a recall notice in the mail this week, regarding problems with the gears – my favorite part of the letter refers to ‘may cause rear wheel to lock up, which may result in a wreck, injury or even death’ – four letters regarding this were sent to the previous owner, and I can’t imagine why they didn’t take care of this- there’s no cost and it seems like a rear wheel lockup would put a serious dent in your riding fun. Don’t you just love little kids? They’re so open to most anything, and they have such wonderful imaginations. She has a wonderful imagination, and always has something funny to say. I know that we adults don’t need to walk around spouting whatever comes to mind, but wouldn’t it be great if we could lift the weight that keeps our minds from coming up with these wonderful stories? Our part of Alabama has been under some pretty dry conditions for most of this year, and we were behind on rain last year too, so I’m always thankful for rain. Hurricane Faye really poured it on us late last week, and the ground is still damp; meanwhile, we’re expecting Gustav to visit us early next week. All this to say that between the weather and tasks around here (plus some minor health problems), I haven’t been able to ride my bike as much as I’d like for about a week now. That’s not to say that I don’t ride in the rain – I love the smell of wet asphalt rolling under my wheels. I just had no desire to scrape myself and my bike across the road during some of the rain we had last week. My husband drove home behind a guy on a bike one afternoon, and even though he was riding on a straightaway, his bike was leaning like he was in a long curve. I hope that changes in the next few days and weeks – Colors for the Cross is this weekend, and we plan on going over early Saturday morning and spending the day. Then September 13 is our group‘s fall benefit ride. We’ll tour Crenshaw County on a poker run, with registration at the park. For more information on that ride, see our site. The ride will benefit a ‘families in crisis’ fund that will help families in and around Crenshaw County who need assistance. Then in November we’ll head out for a weekend trip to somewhere in Alabama. Right now we’re talking about Ave Maria Grotto, but nothing is set in stone yet. That’s one thing about riding- most of the time, it’s about the ride itself, instead of the destination. To see some pictures from last year’s ride, see this page. Of course, I won’t wait til those organized rides to get some miles in- sometimes I just have to ride around town to get my mind back in gear. Meanwhile, I need to go out and crank my bike- she’s been pouting the last few days, and she needs to know that I haven’t forgotten her. For those of you who don’t ride, a bike is different than any other vehicle – most bikes have a name, and most are considered either male or female. My SUV is just a truck, as far as I’m concerned, but my bike? well, she’s my bike- she is mine, and I am hers. Vroom! Vroom!!! !